Belley(?) of the Fish, you must baste it all the time it is Roasting with Clarrot(? ), untill it is just enough, then drop(?) it with butlos(?) and dridge(?) it to froth it up. And if you have not a spit to fit it, you must bind it on with laths, and your sauce is oyster sauce. To make an Almond Pudding Take 2 ounces of Almonds, Blanch them, pound them in a Marble Mortor, 2 ounces of the flour of Rice, One Nutmeg grated, take five eggs, beat them up together, 6 ounces of Butter, a pint and half of Milk, eight ounces of fine sugar; make a very(?) good Crust, then put in the Ingredients, and Bake it nicely. 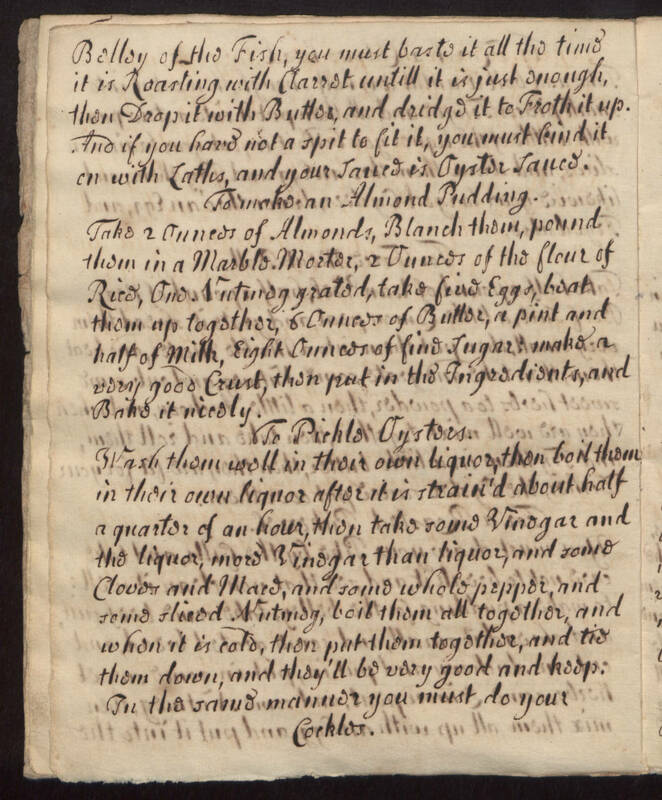 To Pickle Oysters Wash them well in their own liquor, then boil them in their own liquor after it is strain'd about half a quarter of an hour, then take some Vinegar and the liquor, and some Cloves and Mace(? ), and some whole pepper, and some sliced Nutmeg, boil them all together, and when it is cold, then put them together, and tie them down, and they'll be very good and keep: In the same manner you must do your Cockles.